With the economy crumbling and many seeking lean, low-cost marketing solutions, new enhancements by MailerMailer help companies generate more business with effective, do-it-yourself email marketing. The launch of their revamped website offers new features and helpful resources to help make email marketing faster, easier and more powerful than ever. In a time when many are trimming down their marketing spend, new enhancements by MailerMailer can help companies generate revenue for a fraction of what they would spend on traditional promotional methods. eMarketer reports that many people are cutting back on expensive marketing like trade shows and print advertising and putting it into email marketing. 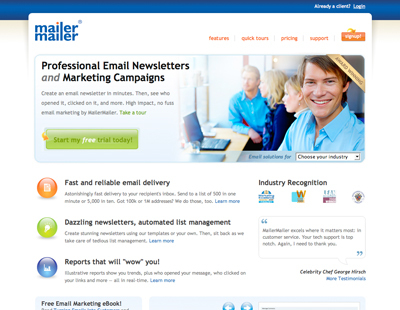 With the launch of their revamped website, MailerMailer makes it easier than ever to get started with email marketing. Visitors will find new technological features and an ever-growing support section packed with articles, reports, and all-new video tutorials to help organizations achieve their marketing goals. The new website is located at: http://www.mailermailer.com/. Report charts & graphs: Customers can see individual message performance displayed on vibrant pie charts. They can also view campaign performance trends with open rates, click rates, bounce rates, even complaint rates plotted on a line graph. Users can pull up complete reports in seconds. LIVE message statistics: Email statistics are now shown in real-time instead of being updated nightly. Live subscriber statistics are also coming soon. A fresh look & improved navigation: Along with an updated interface and theme, the website features reworked navigation to make it easier to find useful tools and resources to create, send and track email campaigns. Additional website upgrades can be viewed at the company blog. MailerMailer is also building up an email marketing resource center to help those wanting to leverage what the Direct Marketing Association reports to be email marketing's $45.06 return on investment. Some of the featured resources include email marketing video tutorials, the email marketing metrics report, and even a free email marketing eBook that teaches how to get started sending successful email campaigns. New visitors are invited to check out MailerMailer's haven of email marketing resources that can be bookmarked for future reference as it will be constantly updated with the latest industry tips and information. There they can find ideas and inspiration on what they can include in their own email newsletters, and sign up for a free trial account. "In a time when competition for people's attention is so fierce, our new platform empowers our customers with the most up-to-date information so they could strategically tweak their content to fit their audience's needs," says CEO Raj Khera. "This is a great time to pick up email marketing and we have catered our system to help businesses achieve the revenue-generating success they desire." MailerMailer is a leading do-it-yourself email list management provider. Equipped with the latest email marketing technology, such as zip code radius targeting, image hosting and fetch HTML from website feature, MailerMailer allows easy creation of professional email newsletters and campaigns. 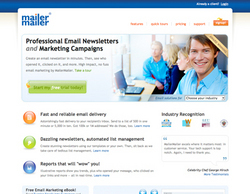 MailerMailer is part of a series of sites run by Khera Communications, which includes discussion group management tool, DiscussThis, and small business resource site, MoreBusiness.com. A free trial of this email newsletter service is available at http://www.mailermailer.com.